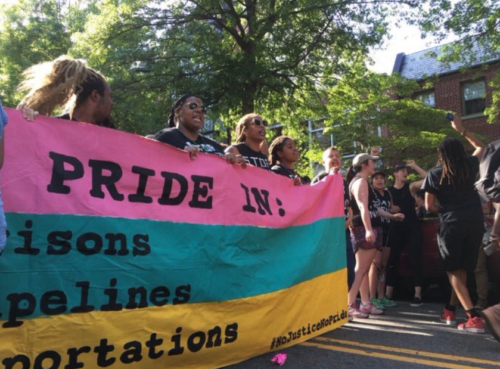 – Unseat and Replace Capital Pride Board with members from historically marginalized communities, Shift power around LGBTQ+ rights from D.C.’s elite to historically marginalized communities, and allow campaigning around critical issues. – Change the narrative that D.C.’s government and MPD are doing “right” by our communities. – Create a community of resistance and radicalism around LGBTQ folks. – Correct the falsehood that Pride would not be possible without corporate sponsorship and branding, and bar from participation all industries that profit from war, detention and incarceration, environmental destruction, evictions, and community displacement. The protestors managed to block the parade three times, including in front of the floats of Lockheed Martin and Wells Fargo. Lockheed Martin is a large defense contractor and Wells Fargo has faced controversy in DC for its investments in the Dakota Access Pipeline project. The parade was delayed by 90 minutes, and No Justice No Pride ended up marching in the original route planned for the pride parade. No Justice No Pride says they attempted dialog with Capital Pride‘s directors before the parade but were dismissed. The protestors were met with angry reactions from parade participants. This isn’t the first time this year that Capital Pride has faced controversy from the LGBTQ left. In April, a Capital Pride executive producer resigned after it was found that he wrote a transphobic blog post for the far-right website Red State.